Google Docs is the leading web-based Office Suite. And, because it’s web-based, you can use the tool directly from web browser without having to install any additional software. Just like regular desktop-based office suites — let’s say Microsoft Office — Google Docs is also capable to handle a complex document. One of good parts of Google Docs is that it has an add-on repository which enable you to add more functions that Google Docs hasn’t had. Each add-on is grouped in 5 categories from Business Tools, Education, Productivity, Social and Communication and Utilities. 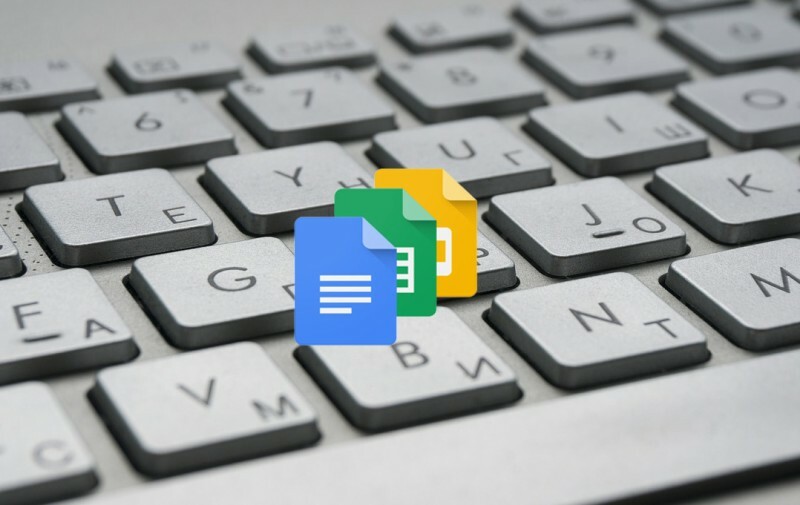 This article is going to show the top 6 simple Google Docs add-ons but helpful enough to assist you doing your documents. 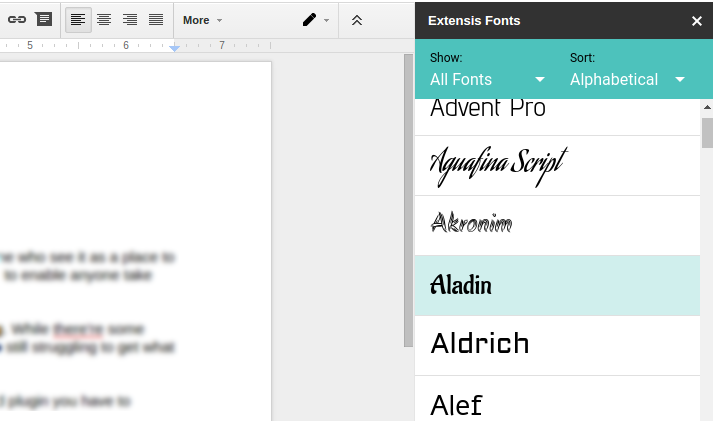 Google Docs has unlimited font options. By default, it comes with around 20 basic fonts. But, you can get more options by pressing the More fonts options which will open all fonts from Google Fonts. As you know, Google Fonts is the best depository of free fonts on the web. So, where is the problem? Great question. To apply a new font in Google Docs (other than default options) you will normally need to click 2-3 times. Sounds trivial but if you extensively use the different fonts it can waste your time. There is a handy add-on that will help you to apply a new font easier than before. It’s called Extensis Fonts. With this add-on you can apply a new font with a single click. Extensis Fonts will open 1200+ fonts offered by Google in a handy sidebar. One key different of Google Docs to desktop-based office suites is in flexibility. With Google Docs you can edit your documents anywhere. You can also invite your friends or office mates to join the document you are working. 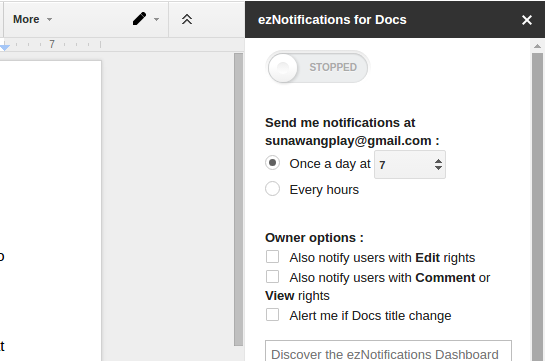 ezNotifications helps you keep in touch with your collaborative document. This add-on will notify you every time other collaborators made some changes over the document. The notification can be customized to make it more convenient and handy. The role of this add-on is a bit similar to Extensis Fonts which help you cut off the time consumption of Google Docs feature. As you know, Google Docs is not different to regular desktop-based office suites that lets you highlight some important words. Normally, you need to select the Text color option from the toolbar every time you want to highlight a certain word. 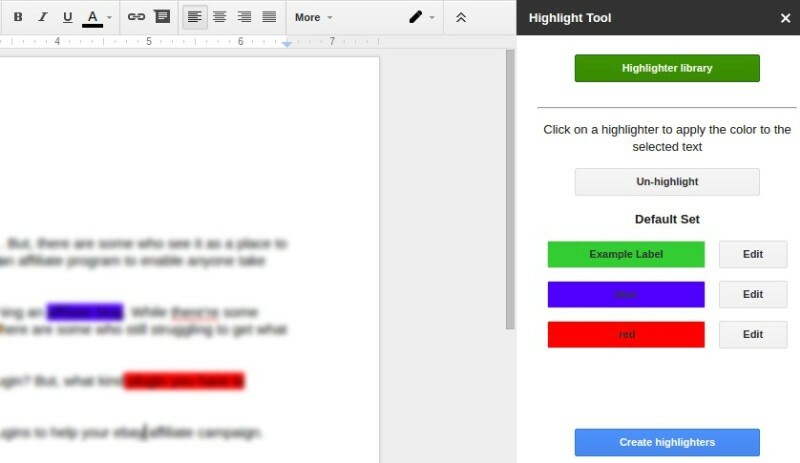 With Highlight Tool you can perform the same task with a single click. More interestingly, you can add multiple customized highlight profiles and just need to click each of them every time you need them. Table of contents is a great idea to be implemented in a long document. It will give you and your readers a better navigation over your document. Table of Contents is a Google Docs add-on that enable you to effortlessly add table of contents on the document you are working. The Table of Contents add-on will show you the content in the right sidebar and you (or anyone) can click on each heading to quickly access the content within the heading section. Have you heard about Wolfram Alpha? The service describes itself as a “computational knowledge engine”. The way Wolfram Alpha works is quite simple. You just need to type a certain word in the available box and Wolfram Alpha will give you some information regarding the word you have typed. For instance, if you type “united states” in the box Wolfram Alpha will display some brief information about the country of Unites States like internet code, population, total area, languages and lots more. 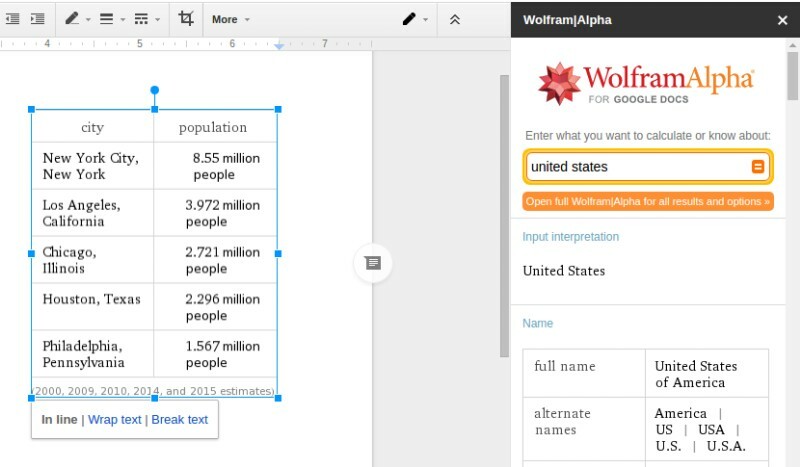 Installing Wolfram Aplha in your Google Docs account is helpful if you frequently write educational articles. 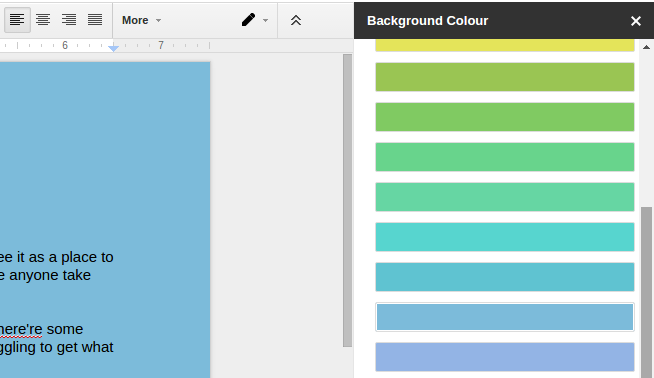 Google Docs also lets you to change the background of the document you are working. You can change the background from the File menu. But again, the regular steps of changing document background is a bit hassle. Pupil Pref comes to fix that hole. With this tool you can change the document background with a single click. Pupil Pres gives you 16 different colors to choose from. All available colors offered by this add-on are based on a research from Prof Arnold Wilkins that are proven to be lighter on the eyes, thus making your work easy.